Oil & Gas :: Coda Octopus Products Ltd.
At Coda Octopus, we have been delivering effective and innovative solutions to this market for over twenty-five years and we service three key product offerings in this sector. We started innovating by bringing to the market the first digitized solution for the geophysical market (GEO Survey). Our geophysical (GEO) family of products have also been instrumental in offshore projects from pipeline inspections to geophysical surveys, thanks to a versatile product set that integrates to all commonly used side scan sonars and shallow seismic sensors and with post-processing software that can be used with all data formats. Our MOTION range of sensors provides precision attitude and positioning solutions for a range of tasks including hydrographic surveying, placement, and landing for use with, or compatible with, all leading measurement and survey sensors. 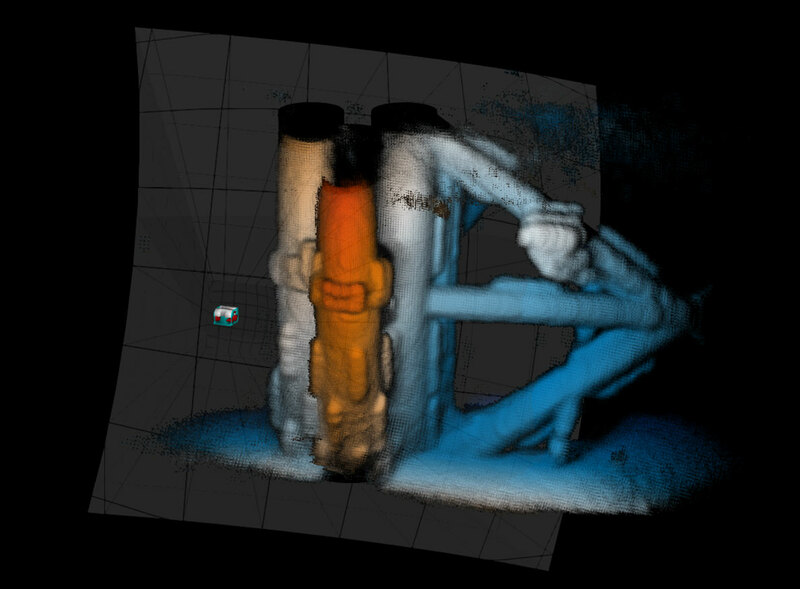 We continued our innovation through the introduction to the market of the first (and still only) commercially available real-time 3D volumetric sonar, the Echoscope®, which generates a real-time 3D image of the underwater environment in zero visibility conditions, of both static and moving objects. Real-time 3D sonars produce thousands of sonar beams over a 2D area for every ping. By calculating the range (and optionally intensity) for each of these beams, a complete 3D image per ping can be created. For example, the Coda Octopus patented Echoscope produces more than 16,000 beams over a typical 50o by 50o area. With ping rates as high as 20Hz, even moving objects can be clearly visualized with real-time 3D sonars. Additionally, combining the 3D sonar data with the sonar’s position and orientation allows every 3D point to be geo-referenced in local or world coordinates. This allows the ping data of static objects to be merged to create mosaics, i.e. full 3D maps of the scene. Our real-time 3D volumetric sonar range has advanced the oil and gas market by assisting operators to navigate their ROV in harsh conditions and helping to place, position or salvage assets from the seabed. Critical Asset Inspections requires careful planning to image the target at the best geometry and distance for the highest data quality. Our CodaOctopus® Underwater Inspection System (UIS) is used on a daily basis as a versatile real-time sonar for underwater inspections of critical infrastructure assets, risk assessment, vessel hull surveys and routine clearance surveys. When divers are deployed in critical subsea operations, it is paramount for top-side dive supervisors to maintain clear and constant visibility or the dive site at all times. The Echoscope®, Coda Octopus’s flagship real-time 3D volumetric sonar, instantly visualizes moving objects underwater live and in 3D, despite zero visibility water conditions. The Coda Octopus 3D and MOTION product families support more dynamic operations including pipeline laying and rapid inspections. The Echoscope® real-time 3D sonar produces a volumetric swath with a large quantity of data points per pulse, in order to visualize moving operations live, in real-time.